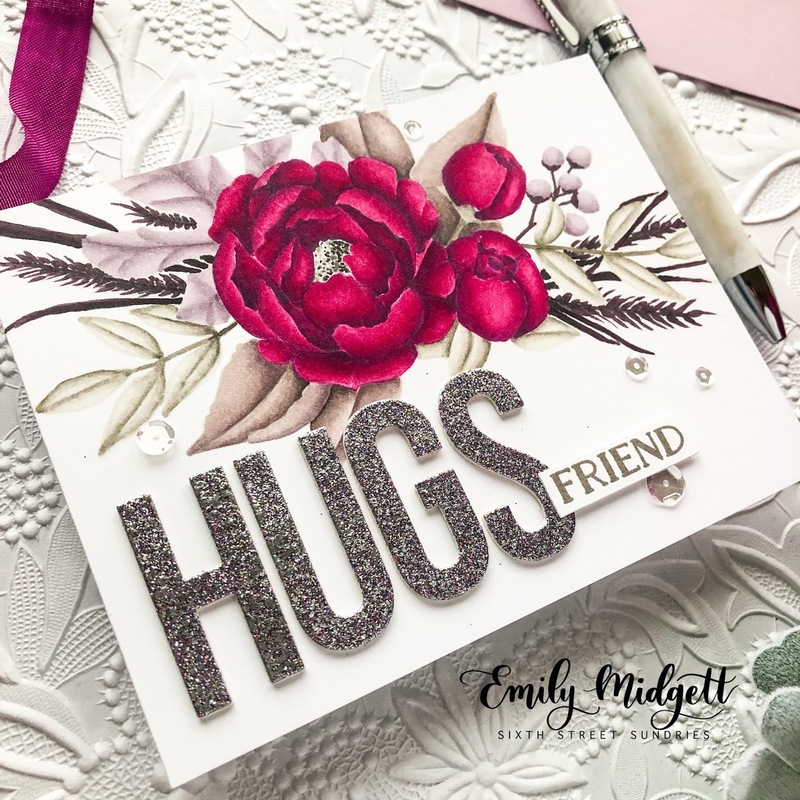 Guest Post: Sparkly Sentiment Die Cuts with Emily Midgett! Hi there! Emily Midgett from Sixth Street Sundries here with you today to share a guest post for WOW! Embossing Powder! I have long loved the huge variety of colors, styles, and textures that the WOW! line carries, and one of my favorite ways to use it is to create molten die cut sentiments, and if they're sparkly... well, that's even better! Today's card features some die cuts that I've dipped in Fairy Dust embossing glitter. Let's get started with the details! 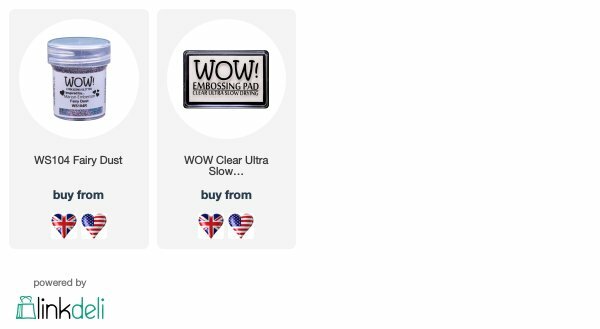 I began by using the WOW Embossing Ink Pad and Fairy Dust embossing powder to create my own glitter paper. I simply put my embossing pad directly to the panel of scrap card stock, covered it with Fairy Dust embossing powder, heated it, then repeated the process to get a really nice thick layer of sparkly powder. 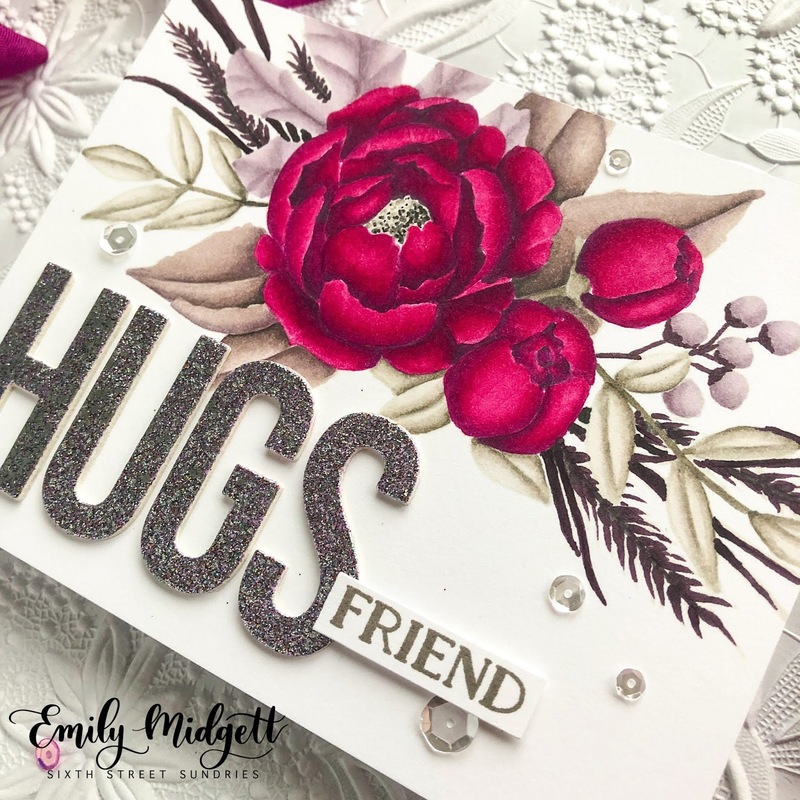 I then used the Big Hugs die from My Favorite Things to die cut a sentiment from this custom glitter paper. 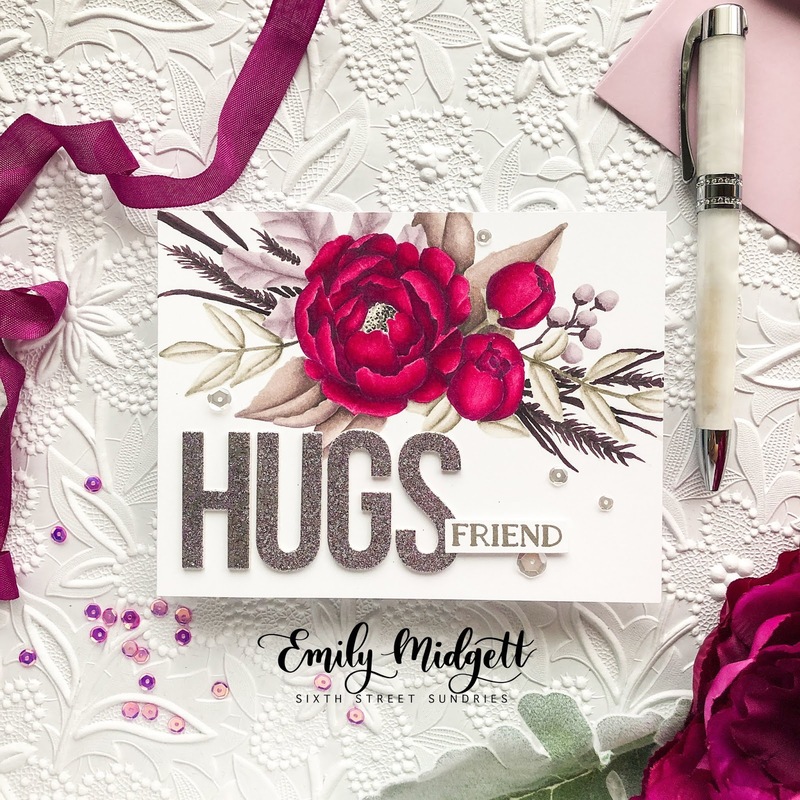 After I'd created my custom glitter die cut sentiment, I used one of my favorite sets from Concord and 9th to create a colorful, non-traditional floral bouquet with the Grateful For Everything stamp set, Ink on 3 Fadeout ink, and my Copic markers. I die cut two more layers of the Hugs die and adhered them together with the custom embossed glitter card stock to create a dimensional die cut sentiment. I also heat embossed a "friend" onto a strip of white card stock. I adhered both pieces onto the colored panel, then added some Sparkling Clear sequins to balance out any white spaces. Well, that's all for me today! Thank you so much to the folks at WOW! Embossing Powder for having me as their guest this month. I will be back next week to share some more inspiration using these wonderful products! What a beautiful card ..I could not take my eyes off the wonderfully colored bloom!! Loved the sparkling die-cuts too ! WOW, this is truly gorgeous!